Friendship blooms on the agricultural campus. You’re often told you will meet some of your best friends during your time at university. That’s exactly what happened for Alana Bent and Ellen Sharp. Since meeting their first year, the girls have been inseparable. You will often find this duo busting out their best moves on the dance floor of the campus pub, cooking up a storm in their kitchen, participating in campus events, or out for a leisurely stroll in Victoria Park. Both girls are active members of 4-H, have both competed in the Maritime Intercollegiate Judging Competition (MIJC) for the last two years, and are also executive members on Dalhousie Agricultural Students' Association (DASA). 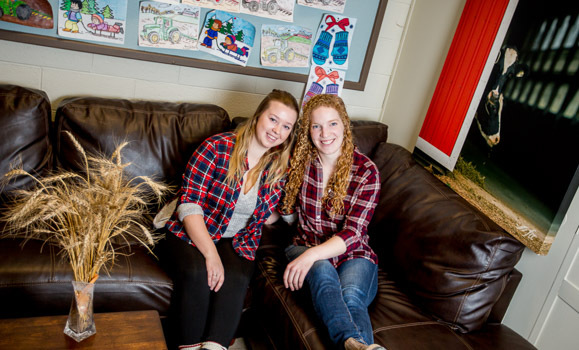 But the similarities don’t stop there, Alana and Ellen are also plant science students, currently in their third year, and are both dairy farmers. “We have a lot in common and I think that is what makes us so close,” the girls say. There are more similarities than there are differences between the two girls. Both girls grew up on dairy farms, though they lived in two separate provinces in the Maritimes. Ellen, VP of External Affairs, grew up in Sussex, New Brunswick, while Alana, VP of Internal Affairs, lived in the Annapolis Valley, Nova Scotia. If it wasn’t for their upbringing, which established their love and appreciation for agriculture, both girls believe they would have ended up elsewhere. Both girls came to campus early in their first year for soccer tryouts and met during their first day. Coincidently enough they ended up living right across the hall on the first floor of Fraser House. “It was our parents who started talking in the hallway that made us awkwardly introduce ourselves,” Ellen explains. During these introductions they learned that Ellen’s grandmother and Alana’s great aunt have been best friends for about 60 years! Their admiration for each other is a true testament to their friendship. “She has been there for me and supported me numerous times and me the same for her. I know I could tell her anything or ask her to help me if I was in trouble and she would be there,” Alana says. Both girls are looking forward to returning home after graduation. Even though they will be five hours apart, if the past is any indication that will not be a problem. “Even though we live far away, every summer we travel to see each other at least once during the break,” Alana explains. Living in different provinces hasn’t put a damper on their excitement for the future. “We won’t get to see each other as much as we are used to, but I’m sure we will be making quite a few road trips as we enter the next big stage in our lives,” Ellen explains. Following in their older sisters’ footsteps, Alana’s brother Johnathan, and Ellen’s sister Cora, are both in their second year here at the Agricultural Campus. Johnathan and Cora, much like their older sisters, are quite close. It appears history is repeating itself for a third time. Consider living in Residence on the Agricultural Campus. Choose from one of three Houses.